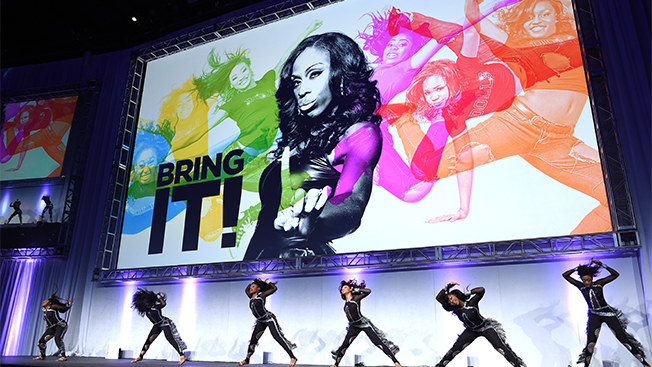 Discovery Communications used to hold one of the biggest events each upfront season, throwing a lavish presentation packed with big names like Oprah Winfrey. But the company began realizing that it ultimately wasn't getting much bang for its bucks. "It's really expensive to do a big gala, and we looked at the list of people who get into the upfront presentations, and the quality of people wasn't as good as it should be," said Joe Abruzzese, Discovery's president of advertising sales. "So I said, let's kill two birds with one stone." Last year, the company scrapped its upfront soiree, instead holding around a dozen smaller presentations with the biggest agencies around the country. "It's a little arduous, but when I looked at the list, it was three times the quality of people we saw individually," said Abruzzese, noting that this new setup—which the company continued this year—cost just one-third of its usual gala. "What happened also was, we stayed afterwards and talked for an hour, so that second meeting was better than just having a shrimp with somebody in a massive room." Each upfront season, more companies are reaching the same conclusion and opting for scaled-down meetings over major events. A+E Networks is the latest convert. This year the company has opted for smaller dinners with agencies and clients around the country to pitch its plans for channels like A&E, Lifetime and History. Disney Channel ended its annual New York event two years ago, in favor of more intimate (though still splashy) client meetings at Disney World and Disneyland. 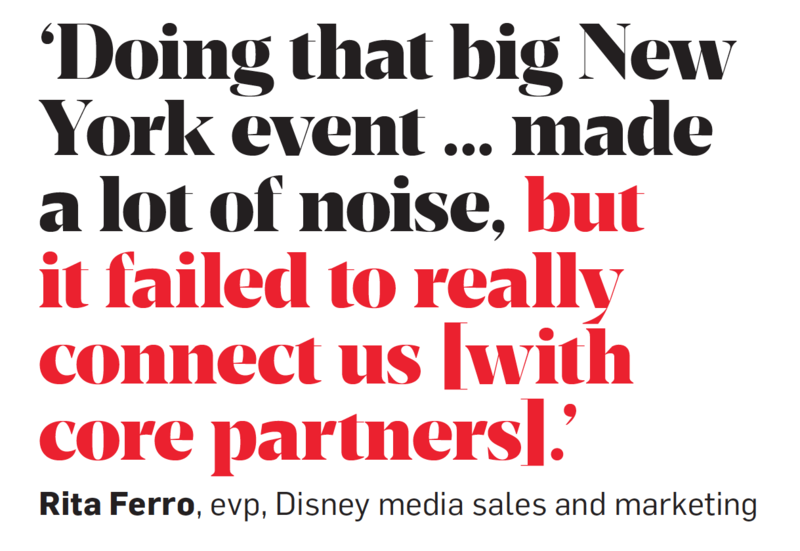 "Doing that big New York event was wonderful, and it made a lot of noise," said Rita Ferro, evp, Disney media sales and marketing, "but it failed to really connect us" with core partners. "Based on the feedback," she added, "this is absolutely the right way to go for us." Smaller networks, meanwhile, are finding that the funds required for a huge upfront presentation would better be spent elsewhere, especially when there's no guarantee that "the big decision markers" will attend, said Brad Schwartz, president of Pop. "As an emerging network, if an event like that is going to cost $2 million, I'd rather have a ninth [original] series on the air." So far, buyers are thrilled to cross more of these big gatherings off their upfront calendars. "The broader events have far outlived their usefulness and don't really draw the real decision makers because they provide little relevant information, take up too much time and don't provide an environment for substantive discussion," said Rino Scanzoni, chief investment officer, GroupM. "The smaller individual meetings can be far more valuable." Still, several other companies and networks continue to see value in the traditional events, including Freeform. Viacom holds separate presentations for many of its channels, and Scripps hosts several major presentations with talent around the country. "We have great support for it and get great attendance," said Jon Steinlauf, president of national ad sales and marketing for Scripps. "I think the media executives around the country respect our brands, they want to be a part of it, and they like the personal touch." And of course, the broadcasters will be still presenting in full force next month, with one significant tweak: NBCUniversal is combining its NBC, Telemundo and cable upfronts into a single event on Monday, May 16. "This really has nothing to do with a money-saving exercise," insisted Linda Yaccarino, chairman, advertising sales and client partnerships, NBCUniversal; instead, the company wants to highlight its unified portfolio via one major presentation. "That's an opportunity to showcase your brand in front of the broader audience," said Toby Byrne, president, advertising sales, Fox Network Group. "You never have a larger audience of the right people in a room than you do that week."